I don’t make meatloaf often, so when I decided to make it for Sunday dinner, I wanted to dress it up a bit. Luckily, I remembered the mouth-watering meatloaf recipe in The Pioneer Woman Cooks. 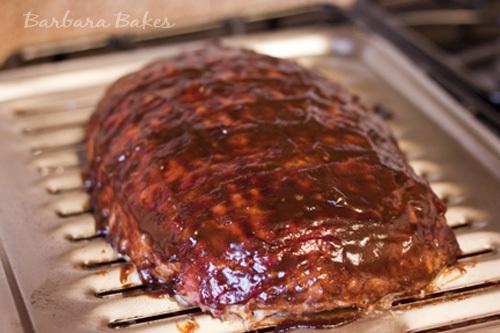 Ree, Pioneer Woman, dresses up her favorite meatloaf by wrapping it in bacon and slathering it with tomato gravy. I was in a hurry after church and substituted our favorite BBQ sauce for the gravy. 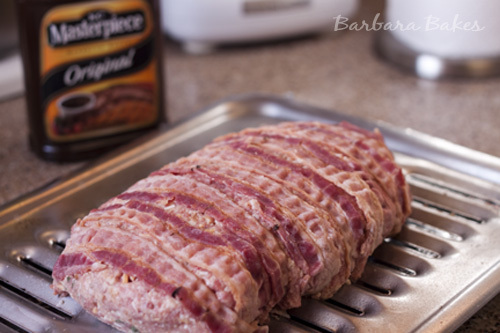 It’s a fabulous combination of flavors and this is my favorite meatloaf recipe now too. Pour the milk over the bread and allow it to soak in or several minutes. With clean hands, mix the ingredients until combined well. Form the mixture into a loaf shape and place on a broiler pan, which will allow the fat from the meat to drain. Line the bottom of the pan with foil to make clean up easier. Make the tomato gravy. Pour the ketchup into a small bowl, add brown sugar and dry mustard and splash of hot sauce. Stir the mixture until well combined. Pour one third of the tomato gravy over the top of the meatloaf. Bake for 45 minutes, then pour another one third of the remaining tomato gravy over the meatloaf. Bake for an additional 15 minutes. Serve with the remaining tomato gravy on the side as a dipping sauce. *Next time I make it I’ll reduce the bread and milk by half. ** I substituted Masterpiece Original BBQ sauce for the tomato gravy. Hi Caroline – yes, my husband often uses leftover chilled meatloaf to make a sandwich the next day. Just put two of these in the oven, our new Pastor is being installed this afternoon and we are serving meatloaf, mashed potatoes and green beans. There will many other meatloafs but I am betting these will be the best! That’s great! I just put two on my smoker 🙂 My husband asked for it for his birthday dinner. Enjoy! 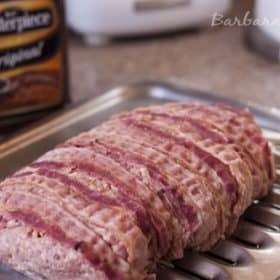 This is now the recipe I use every time I make meatloaf!! My family loves it, and grandson most definitely loves “grandma’s meatloaf” he asks for at least once month! What I do differently is I don’t use the bacon and I add minced onions to the tomato gravy. Thanks for sharing Tracey – how fun that your grandson asks for it! It’s the only way I make meatloaf too. I followed the reciepe exactly and was disappointed in the flavor. Perhaps you would have preferred it with your favorite BBQ sauce as well. Made a few changes. I used herb seasoned stuffing mix, diced carrots, celery and onion and ground venison. Used the published sauce. Over the top delicious! Keep your recipes coming Ree! Great! Thanks for sharing Maddy! I’ve made this twice now and it is wonderful! To make it a little less fattening I used half ground turkey half ground beef. I also used almond milk and gluten free bread because my family has food allergies. It’s just fabulous! Thanks for sharing your changes Marilyn! Glad it’s a hit. Hi Doreen – I’ve never tried it when it was frozen, but I would assume it would just need a few minutes more cook time. I made this and posted about it a while back too and have to admit I fell in love. The combination of bacon and tomato sauce and the meat is just delicious! I don’t know how you could beat this meatloaf for a group of hungry men! On my menu for this week. I love the idea of using a bottled BBQ sauce for the gravy. its fantastic that u dressed it up and u have done it beautifully! Huggies and loveee to ya , Mia! Mmm, how can you go wrong with bacon, over . . . just about anything! This looks divine. That is fancy meatloaf and I bet the bacon flavour cooking into it would be so tasty (not to mention smell amazing while it’s cooking). I love the name too.